Why Use Professional Miami Video Production Services? ... And why choose us? Here's Why! Almost all businesses and organizations that want to be successful in our modern world need to use video as part of their communication mix. You can use video for product demonstrations, company presentations, training sessions, public relations, conferences, meetings and events, and more. If you're looking for a Miami video production for business company, you've come to the right place! First, Why Choose a Professional Company for Miami Video Production Services? Most people can shoot their own videos, however If you want a high quality video to represent your company or business, it is advisable that you hire a professional video production company. If you're anywhere near the Miami area, you’re welcome to contact our specialists for an in-depth discussion about your project. There's no obligation to you at all! We are proud to deliver some of the best Miami video production services, with an unmatched level of quality and great attention to customer service. • We can develop and write your script aimed at your target audience, and based on their preferences and needs. All designed to help you reach your goals. • We can shoot in a professional TV studio, if you don't have a specific location in mind. We can also scout the most appropriate locations for your Miami video production (or your South or Central Florida shoot also). • We can use chroma keying (green screen), adding post production backgrounds and effects. The end result looks very natural. • Our video production company can help you capture an event with high quality sound and images, by using the best equipment available for your project and budget. We can also edit the footage, so your video conveys your messages with great clarity. • We've got professional actors and extras that can play in your video. We partner with a few talent agencies that help us find the best casting for our clients' projects. • If you need to author, duplicate and package DVDs for distribution to your prospects, employees or customers, we can provide these services to you. • We can dub or subtitle your videos in almost any language, and the quality of the translations will be excellent. Even if you think you can shoot a good quality video by yourself, we know how to shoot the video with editing in mind. As we shoot your video, we are considering how each shot will be edited into the final video to increase its effectiveness. The difference in our shooting and editing will be noticeable, and our videos get results! Professional post production is critical for creating the desired effect in your audience's mind. Our Miami video production company team can include voice over narration, music, special effects, animation or motion graphics, to make your video shine. Want help with your Miami Video Production project? Contact us for a quote. Our clients are extremely pleased with our services and, most of all, with the special attention we give to each of their projects. We have the habit of over-delivering and we always strive to create the highest quality work possible. Our crew members, artists and technicians are well trained and skilled in their professions. They’re highly motivated and use their experience and creativity in everything they do, in order to meet the highest standards. The more successful our clients are, the more successful we are! Or Use the Contact Form on the top right of this page. South Florida Small Businesses Visit Here! 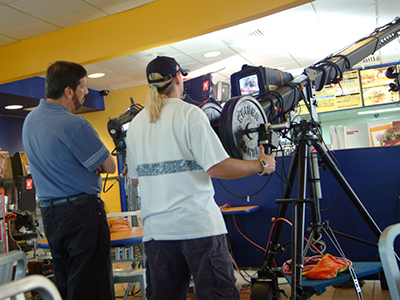 Visit our Small Business Video Production Page for South Florida. Our 100% Satisfaction Guarantee to You! 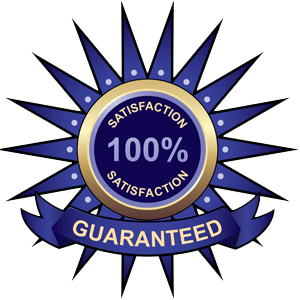 To our knowledge, we’re the only Florida video production company that offers a satisfaction guarantee!